I’ve lived in NYC for a long time. So long that I’ve pretty much lost count. Three years ago, in need of a place to get away from frenetic city life, I found the perfect place only two hours from NYC: Woodstock, NY. With a population of 6,000, this place is QUAINT. It’s, of course, known for that little 1969 music festival — that didn’t actually take place in Woodstock. My number one recommendation is: do nothing. But, if you HAVE to be a busy-body (like any true New Yorker), here’s my top list of things to do — from hiking to swimming in big holes to listening to old-school bands and eating to your heart’s content. Overlook Mountain is an medium-strenuous 2.5 mile uphill hike (5 miles round trip), not for the faint-of-heart. It’s a gravely hike. 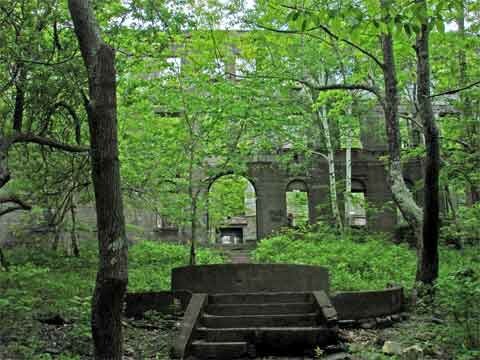 My favorite part is the story you’ll see along the way — Outlook Mountain House, a Guest House, and an old abandoned hotel. Reward yourself with a beautiful view of the Hudson and Catskills once you summit. And climb the Fire Tower! Haven’t been here but have spoken to plenty of locals, who attest that thisthis quiet, secluded watering hole is where it’s at. It’s unsupervised, and feels like you’re swimming in nature. Peaceful. The Woodstock Land Conservancy website describes Thorn Preserve as home to “the most painted views” of Woodstock’s Overlook Mountain. I would agree. It’s a big field, a flat walk, so don’t go expecting a woodsy walk, and a nice place to spend a peaceful moment. I’m a bird-lover, and you can see a lot of birds. It’s adorable. The Woodstock Playhouse is great. I’m always going to see shows and plays in NYC, and it’s nice to have a bit of culture in Woodstock (especially when I want a break from all that nature and peacefulness). How I go: I like going to dinner and then checking out a play or comedy show here. Cool, because there are a lot of bands that play at Bearsville Theater. Usually obscure bands, or bands past their time, but yes to nostalgia old 80s bands that have come and gone! It’s all in one complex with Bear Cafe and Little Cafe — so you can go do dinner and then see a show. Also where Woodstock Radio Station is. The Bear Cafe sits alongside a stream, so come here to enjoy really great drinks and a tasty dinner. It’s one of the best-known places in Hudson Valley known for its eclectic vibe and bistro-esque food. There are some interesting vegetarian dishes and it also caters to meat-lovers — so it’s a win-win for everyone. It feels like someplace you might go in the city. I was surprised. The Little Bear is Chinese food, but its good! You don’t expect that in a place like Hudson Valley. You expect fusion maybe, but this was authentic, tasty, flavorful and well-done. If a New Yorker says it’s good, then you know it’s good. Catskill Mountain Pizza is a little hole in the wall, in town. The first time I went in I I thought, how good a slice can you actually get? But it was excellent! Maybe it was the yummy sauce, and pizza itself is delicious. This place is popular, you’ll stand in line to get a pie. It’s also one of the few places that delivers so you can get it delivered to you! When I’m there, I get the Margherita Pizza. My last thoughts: I don’t really like pizza, but really liked this. Sunfrost Farms is a fantastic place to get baked good and super fresh produce from local farms in the area. So, on point! Very tasty baked goods! They also serve breakfast and lunch here — eggs, tofu scramble, enchiladas, etc — I haven’t tried these, but looks delicious! NY 212. No address or sign, so can be easy to miss the entrance if you don’t know what to look for. Entrance is on the right, immediately after private Casablanca Lane — looks like a trail into the woods marked off with a barrel on each side. Corinne’s buddy really likes watching soccer here. I am a suspender-connoisseur, a birder, and former guitarist/bassist. Proud to be born and (mostly) bred in Brooklyn.